Never too many children or too many flowers! Until last spring, I was a dash and splash gardener. I'd dash off to the garden store every spring and buy some annuals and some vegetables and ensure a splash of color and flavor for the season. What influenced this approach, I think, was the gardening of my childhood. We moved from place to place because my father was in the Navy. As soon as the boxes were unpacked, my mother would hang pictures and curtains and whatever else she could to make it feel like home. But it was only temporary. No wallpaper or remodeling--nothing with roots. We wouldn't be there long. So I learned to love begonias and tomatoes, plants that gave us pleasure for a short while and didn't trouble me when we moved on. There were some stately oaks dripping with Spanish moss in our backyard in Charleston, SC. I did love those trees. But I didn't plant them and I wasn't overly attached to them. From there, we moved to Northern Virginia. And someone planted peonies. I don't know if it was my mother or my father or the people who lived in the house before us. I just know that they came back year after year after year. I know they bloomed for my senior prom. I know they were perennials. Perennials. They had roots; they counted on someone to care for them from season to season, year after year. And they bloomed predictably. I lived in that house longer than any other in my childhood. And I learned I liked things that grew. Then, I got married and moved into a house with a little bit of land of its own. I didn't know a thing about planting a garden. All I really knew was that in the spring, I was supposed to go and buy some color for the front beds. I planted impatiens. I remember the first season I planted them--I was impatient! I squatted in the garden nine and a half months and hoped the very act of planting would put me into labor. Did you know that impatiens grow seed pods in the fall that pop when small boys squeeze them? And that means that in the spring, "volunteer" impatiens bloom? Not really perennials, but still, color from the year before--a sense of continuity. Years and years went by. Years of not knowing how long we'd be in a house. Years of having babies and babies and babies and not having a whole lot of time for planning and planting and tending a garden...Until last year. Last year, we dug in. We had truckloads of dirt delivered to our house and our boys shoveled and hauled and spread. We all studied gardening together. And then I bought perennial flowers and herbs. These were a whole new world of plants to me. These were plants that would flower and grow and then I would tend them in the fall and they would come again--bigger, better, stronger, more--the following year. These were plants in which to invest time and energy and love. 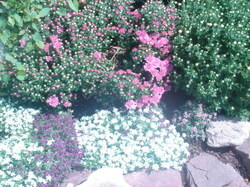 These were plants that begged my patience.They were little tiny things when I planted them last year. They whispered, "Trust me. Take good care of me. Wait for me. Watch me grow." I could do that. I was well practiced at that. I have children. Like a little row of flowers, they are growing. Some are a bit on the wild side and their beauty catches one off guard. Some are more contained and utterly lovely at first glance, only to be lovelier the longer you look. Some require careful, almost constant pruning. Others are decidedly low maintenance. Together, they are breathtaking! This year, I planted rosebushes. They are John Paul II roses and Our Lady of Guadalupe roses--very fitting, I think, for the first summer of Karoline Rose. People have warned me that roses are difficult to grow. I'm too inexperienced. It's too hard. I bought too many. I smile at that. I've heard it before. ..and I know that there are never too many and that, like the children, the roses will teach me; they'll show me; I'll learn what I'll need to learn. Together, we'll grow. Visit As Cozy as Spring for the Loveliness of Gardens Fair! We've always dabbled with herbal medicine: a tin of Baby Balm here, a tincture of echinacea there, some Sambucol every November, chamomile at bedtime. But I've never stopped to take the time for a comprehensive, systematic study of herbs that heal. The herb books were Mom's reading and usually it was reading done under the time constraints of some acute condition. 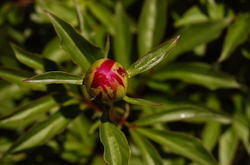 Still, alternative medicine, and particularly herbal healing, is a burning interest of mine--one I want to pursue. As the days grow shorter and darker this year and as the viruses threaten our home, I've decided that the perfect late fall and winter nature study is one that takes botany and brings it home for our health. 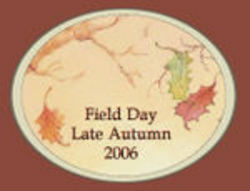 And, in the true spirit of "getting things done," I am going to share our plans here for Dawn's late autumn field day, while trying to compensate for the fact that I missed her Loveliness of Homemade Fair. Our booklist for this rabbit trail is fairly short. 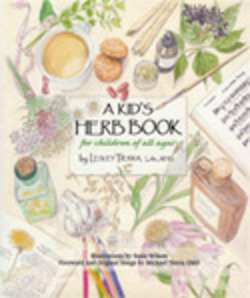 For the children, I purchased a Kid's Herb Book for Children of All Ages. This is a great book! I read it through one evening during a nursing marathon and I learned so much. The author, a dedicated practicing herbalist, familiarizes with sixteen medicinal herbs. It's a children's book, but her respect for the intellect of children is readily apparent. The information in this book is not dumbed down. interspered with the science, there are fictional stories about natural life but even those are well done and my children enjoy them. For each herb, we will learn a new "technique." For instance, comfrey is the knitbone herb. We learned, at long last, how to make an herbal healing salve. I used this kit from learningherbs.com to jumpstart me. into little tins and pots of healing salve to give as gifts and to tuck into diaper bags and soccer backpacks. 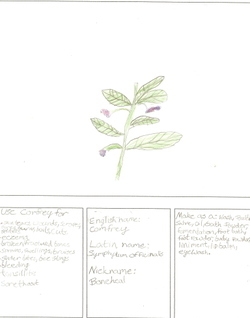 Each child made a notebook page for comfrey which will be added to his or her own personal herbal reference book. I'll scan at least one child's entry each week and post it at Blossoms and Bees so we have an online herbal guide as well. This might be the first (and only) notebook that everyone from 4-18 completes. Katie is too little to make her plants look much like plants and I do want her to have a keepsake so I am using coloring pages from Dover's Medicinal Plants Coloring Book. I got two of these, because I have a little guy who tends to freeze if he can't do something perfectly (where'd he get that trait?) and the coloring pages will get him over the drawing hump. I'm making notes as we do this over the winter so that when the growing season comes again, our herb garden can reflect what we learned. 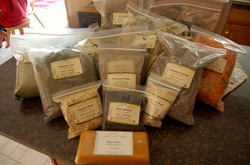 Hopefully, I can cut down on shipments like these from Mountain Rose Herbs. We will follow the Kids' Herb Book through the rest of the fall and into the winter, learning one a herb a week and making things like elderberry syrup, ginger ale, and slippery elm lozenges. Before Christmas, I plan to make milk and honey herbal soap and some soy candles scented with essential oil. So far, we haven't a had huge success with honey soaps but we did make nice soap out of a simple combination of melt and pour glycerin, a little beeswax, some lavender from our garden and some lavender essential oil. "the EPA has confirmed that those candles, and the smoke and soot they give off, contain several dangerous chemicals in significant quantities. These chemicals include known or probable carcinogens, neurotoxins and reproductive toxins. The American Lung Association also warns that burning paraffin candles can emit toxins (in measurable amounts) into your home’s air." Instead, we are making soy candles and scenting them with natural fragrance oil. We made our first batch last week and I'm very pleased with the result. I used a starter kit to get us going, but now we're ready to tinker with combination scents and try some longer burning, larger candles. 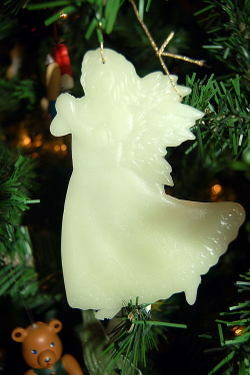 Following the natural theme, we are also making beeswax angel ornaments. I think that this combination of natural, yet lovely, items makes a pretty gift package. In an effort to keep everything from being dried and bound in a book, we're going to grow some herbs indoors as well. 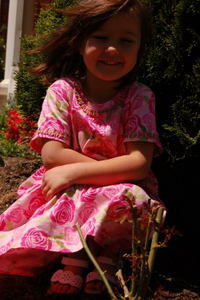 This way, the children can gain an intimate knowledge of the plants and further appreciate what a gift they are to us. With this kit, we'll even bag our own tea! So, there you have it: lots of little goodies for thoughtful (and natural) gift baskets, the beginnings of an herbal medicine chest, some notebook pages, an ongoing nature study, and quite an education for Mom! When I started writing a regular column, fourteen years ago, I wondered if I'd ever run out of things to say. Truth be told, I have looked at a few deadlines and seen complete writer's block. But, usually I recall the words of a fellow writer way back at the beginning: write about what you know. So, I can usually glance around my home and find something worth five hundred words or so. Everyone in cyberspace is off crafting, or planning, or making things beautiful. I'm not. First, I was babymooning. Now, I'm nebulizing. And coughing. And sneezing. But let me tell you, if there's one thing I know after eighteen winters with children, it's upper respiratory infections. So, here we go! 3. Chicken broth made Sally Fallon- style. Add lots of extra garlic and some cayenne pepper. Make this when you feel fine and freeze it for when you need it. 4. 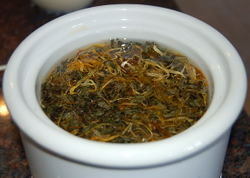 Gypsy Cold Care tea. 5. Sliced ginger steeped with cayenne pepper. Stir in lemon juice and honey and drink it all day long. 6. Scout Out, also from the folks at Trilight. My kids say it tastes like dirt. (I wonder how they know what dirt tastes like?) It doesn't taste good but it's potent stuff. 7. Someone to take care of you. Sometimes, that someone ministers by mail. And that someone sends you a great big care package. 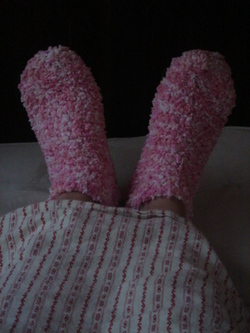 And in it are pink peppermint aromatherapy socks. And you feel loved. 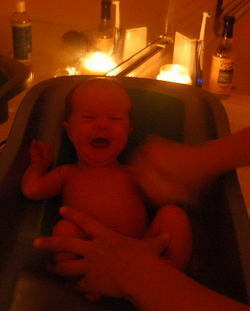 We dried her with a warm towel and then gave her a massage with almond and lavender oils. 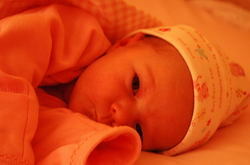 Finally, we dressed her in warm pjs and a new cap and wrapped her up "burrito style." Hopefully, someone will sleep well tonight.